DivestNU, a coalition of student groups at Northeastern University, set up tents in Centennial Common from Monday, Oct. 3 to Saturday, Oct. 15, 2016. The movement is dedicated to the University divesting, or removing all investments, from the fossil fuel industry. They began escalating their protests after a student referendum in 2014, in which 75 percent of the 3,625 student voters chose to divest. The University created the Social Impact Council later that year in response, who in March 2016 recommended full divestment from the fossil fuel industry. The University has not accepted that recommendation or committed to divestment. It did, however, announce in July 2016 that it would invest $25 million in "environmental sustainability," such as clean energy, renewables and agriculture. "We have deliberately chosen to invest, not divest. This approach is consistent with Northeastern's character as an institution that actively engages with the world, not one that retreats from global challenges," Northeastern Senior Vice President for Finance and Treasurer Thomas Nedell said in a statement in July 2016. Not believing that the University's action was ample, DivestNU began their encampment of Centennial, as well as other actions. They held multiple rallies in Centennial, as well as delivering a letter, signed by 58 faculty members, to the Provost James Bean's office calling for divestment. On Saturday, Oct. 15, 2016, DivestNU ended its stay in Centennial. On that day, they staged multiple mock oil-spills and pretended to die demonstrate the effects of human-driven climate change. In addition, the group disrupted the 2016 State of the University Speech on Thursday, Oct. 20, when Northeastern President Joseph Aoun took the stage. "We demonstrated our capacity to assert the student voice, and together we're going to old President Aoun accountable to this question: will he stand with students or with the fossil fuel industry?" Austin Williams, co-founder of DivestNU, said. DivestNU tents are posted in Centennial Common on Monday, Oct. 3. The student group coalition began their protest earlier that day asking the University to remove its investments in the fossil fuel industry. DivestNU member and Northeastern sophomore Ben Simonds-Malamud, left, pulls a large tarp over the front of Centennial on Monday, Oct. 3. The sign reads "Stop Funding Climate Change." "[Northeastern] basically said as long as we're peaceful and nonviolent ... they're not going to evict us," Simonds-Malamud said. DivestNU member Charlie Cavallaro, left, talks to Northeastern sophomore Philip Wesley, right, about climate change and policy on Centennial Common on Monday, Oct. 3. DivestNU members Savannah Kinzer, left, and Alissa Zimmer, right, tape a sign to tents during a protest on Centennial Common on Monday, Oct. 3. "I've been part of [DivestNu] since my freshman year. I think over the years seeing how this issue has brought together this community has inspired me to keep on going through the years and sleep out here," environmental studies and political science junior Zimmer said. DivestNU member Ben Simonds-Malamud hands out flyers during the group's almost two-week stay on Centennial Common on Tuesday, Oct. 11, 2016. DivestNU member and freshman Brianna Brazee pokes her head out of a tent on Centennial Common on Tuesday, Oct. 4, 2016. At 6 p.m. that evening DivestNU conducted a rally on Centennial. DivestNU co-founder and senior Austin Williams speaks to the crowd during a rally on Centennial Common on Tuesday, Oct. 4, 2016. The rally consisted of various chants, as well as musical presentations from other members targeted at Northeastern's refusal to divest. Left to right, DivestNU members Alissa Zimmer and Nick Boyd talk on the night of Thursday, Oct. 13, 2016. As part of the group's protest, dozens of students slept on Centennial Common in tents for almost two weeks. "I have always been an environmentalist. I also heard ... about the divest campaign, the importance of divestment in the fight for climate justice and the administrations's refusal to work with students," Boyd said. "I knew it was something that I had to get involved in." 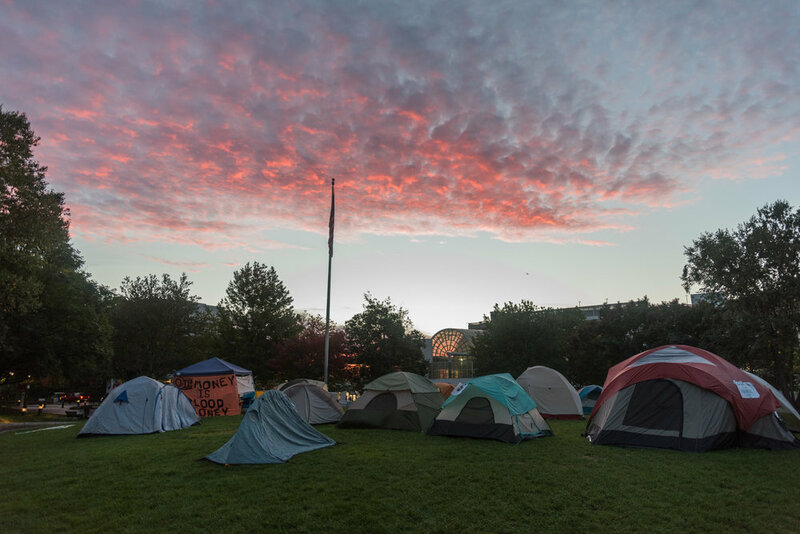 Dawn rises on DivestNU tents on Centennial Common on Wednesday, Oct. 12, 2016. DivestNU is dedicated to getting Northeastern University to divert investments in fossil fuels and had been protesting in Centennial for over a week. The temperature was 45 degrees at sunrise. 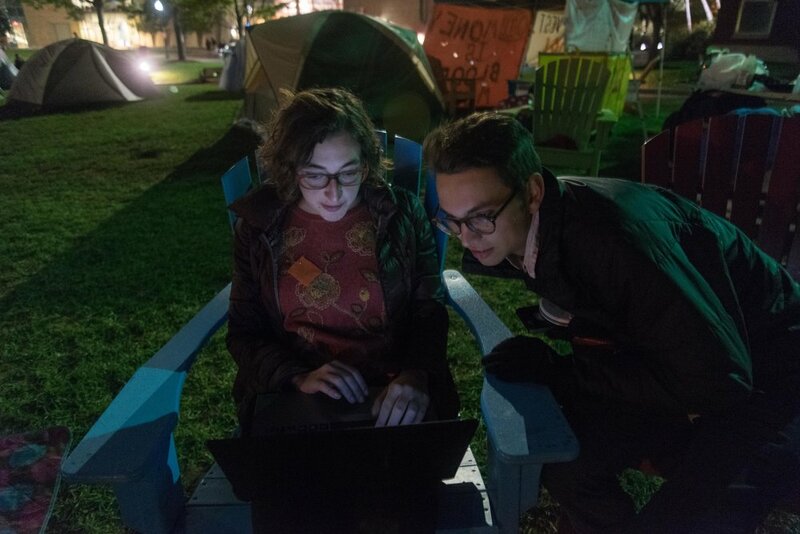 DivestNU co-founder Austin Williams, left, makes future plans for the group to get the university's attention on the night of Thursday, Oct. 13, 2016. DivestNU members chant at passing prospective student groups on Saturday, Oct. 15, 2016. "Climate change is violent, so is Northeastern's refusal to divest," the students said. Left to right, DivestNU members Haley Havens and NIck Boyd pretend to die at Centennial Common on Saturday, Oct. 15. After camping in the common for 13 days, DivestNU staged an oil spill, symbolized by the black tarp, and die-in to protest Northeastern's investment. This protest took place on one of Northeastern's busiest days of the year, prospective student day. "[This protest] puts the problem into a context people can visualize and understand. It represents in a literal sense the people who will be affected by climate change," Havens said. Students walk past Centennial Commons on Monday, Oct. 17, 2016. DivestNU ended their encampment of Centennial two days earlier. "We didn't gain any specific steps from the administration towards divestment. We were, however, very successful in building recognition and social power," DivestNU member Nick Boyd said. DivestNU co-founder Austin Williams, left, listens to member Alissa Zimmer as they discuss their plans to protest the 2016 State of the University event on the night of Tuesday, Oct. 18, 2016. The meeting served as both planning and debriefing for the end of their encampment in Centennial. "We wanted to take some time to reflect on [the occupation,]" Williams said during the meeting. DIvestNU members James DeCunzo, in view, and Nebai Hernandez are escorted by security back to the audience after attempting to obscure camera views of the 2016 State of the University stage in Cabot Center on Thursday, Oct. 20. "I knew security would be on me in a matter of seconds, but I also knew the importance of our action," DeCunzo said. "I remember how much my hands were shaking after security had pulled me to the side -- not from fear, but from excitement." 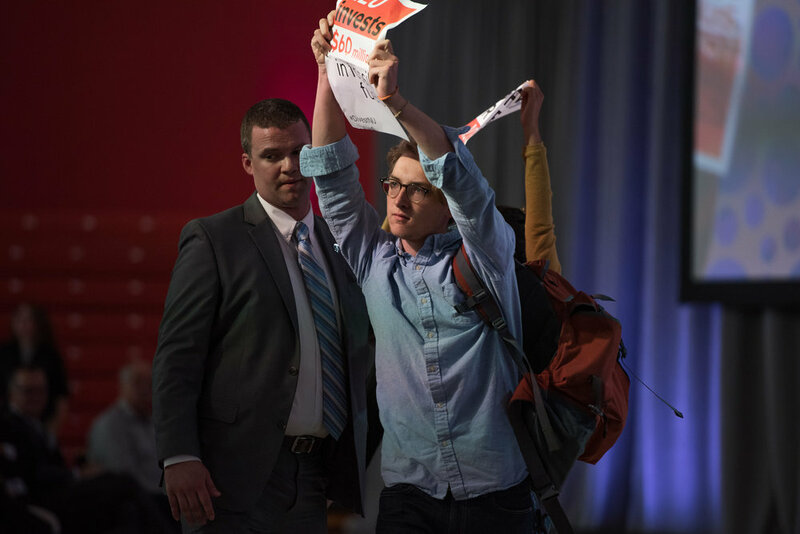 DivestNU members disrupt the 2016 State of the University on Thursday, Oct. 20. "Today you will tell us that Northeastern is a leader in sustainability, while you continue funding climate change," the students chanted. Northeastern University President Joseph Aoun stands silently while DivestNU protesters protest during the 2016 State of the University event on Thursday, Oct. 20. DivestNU members began to stand up and disrupt the presentation as soon as Aoun took the stage. "Thank you very much, let's give them a round of applause," Aoun said, after they had finished chanting. Co-Founder of DivestNU Austin Williams said this move was likely a tactical decision by the administration to deflect fault. "The administration's strategy of acknowledging and celebrating our advocacy is a cynical attempt to deflect attention away from the critique that we raise," Williams said.